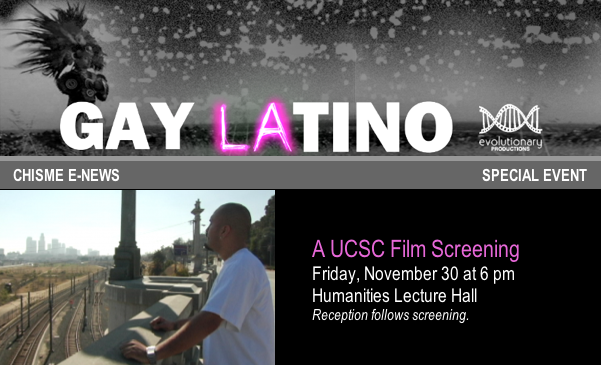 The campus community is cordially invited to a "Premiere Screening" of Gay LAtino Part I: Coming of Age on Friday, November 30 at 6:00 pm in the Hummanities Lecture Hall. This will be an evening of celebration, with a post screening reception where we can meet some of the participants of the film. This is a production of one of our own Digital Arts and New Media students at UCSC, Jonathan Menendez. The screening provides us with an opportunity to engage in a community dialog on Queer Latino issues, coming out, and to discuss what it means to be a queer man of color in America. Click here to see a short video clip on why you should attend the film screening.